By moving your real money blackjack playing action online you are instantly going to have available to you a much larger range of differently structured blackjack game variants than you would ever find on offer in a land based casino. One blackjack game which is worth taking a closer look at is the Big Five variant, this is a game which is on offer at all Microgaming powered casino sites and comes with its own unique set of playing rules which can be quite liberal. Those playing rules permit players to be able to double down on any initial two cards which have been dealt out to them and players are also given the option of doubling down their hand and purchasing one additional and for the same stake as their initial wager whenever they have split a pair of cards. Splitting cards is permitted not just once but three times and as such you can end up playing of four hands off just one initial set of two cards if you keep on slitting them, the cards which can be split are any matching value cards which includes any cards with a value of ten such as a Jack and King. One beneficial aspect of opting to play blackjack online as opposed to playing in a land based casino venue is that you are going to have a much wider spread of staking options on offer to you. For example when you choose to play the Big Five Blackjack game you are going to be able to put into play stake levels as low as just 1.00 per hand or as much as 200.00 per hand. The winning payouts are all the standard ones on the Big Five Blackjack game and as such any blackjack hand deal tout to you but not after splitting is going to see you being paid out at winning odds on that hand of 3 to 2, the standard payout on all other hands is even money and the insurance wagers pays 2 to 1. Which is the standard payout for that optional side bet insurance wager. 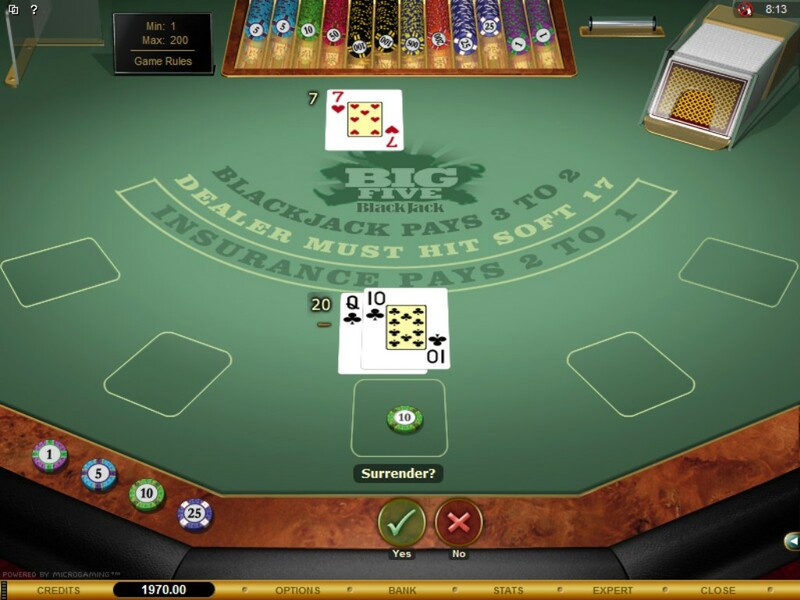 If you do fully master playing this blackjack game variant then over your long term play with perfect strategy you will be able to get the house edge down to a quite manageable 0.47%, but be aware there are many other much lower house edge blackjack games on offer online, so it may be worth playing those games instead of this one. When the dealer is dealing out the cards to himself and you he is going to deal himself just one initial card which is dealt facing upwards, he will only ever deal out his remaining cards once you have played off your hand. There are five full decks of playing cards which are always shuffled before a new hand is deal tout in play on this blackjack game variant and whenever a soft 17 hand or anything lower has been dealt out to the dealer he will hit those hands. The dealer is obliged to offer players the insurance side bet wager whenever he could possibly end the game with a blackjack hand and to take that option you need to place an additional side bet wager which must be exactly half of the amount you wagered on your base hand. To be in which any chance of having a winning session you will need to be able to play this game with the best strategy in place, which means playing every single hand correctly based on just what card the dealer is showing. We have therefore loaded into this website the perfect playing strategy card for Big Five Blackjack so make sure you save it and use it! Below are some of the easier to remember ways of putting into pay perfect strategy for this blackjack game. Early Surrender – You will be able to throw your hand away and get half of your stakes back by taking the Early Surrender option offered on this blackjack game, but there are surprisingly only six times when that is the correct decision to make. When you have a hard 14, 15 or 16 or a pair of 7’s or 8’s and the dealer has a 10 card then you should take the Early Surrender option and also when you have a hard 16 and the dealer has a 9. Doubling Down – There are quite a number of times when you should double down your hand, and with that in mind please make sure you make use of our blackjack strategy card for this game as it shows you each occasion when playing this game that you should double down. One of them is when you have be deal out a soft 16 and the dealer is showing a 4, 5 or 6 valued hand. Remember doubling down will cost you an additional wager the same value as your initial bet. Hitting a Hand – As soon as you have been dealt out a very low valued hand such as a 5, 6, 7 or 8 then no matter what card the dealer has up-facing via his hand you need to hit those hands. Only ever hit a soft 18 valued hand when the dealer has a 9, 10 or an ace showing, that is also true for a soft 17 and, but when you have a soft 17 always hit it when the dealer is showing a 2 card. When to Stand – If you are dealt out a hard 17 valued hand then that is the best time to stand your hand, no matter what card the dealer has on display via his initial card. Also do not split any pair of ten valued playing cards dealt out to you as the best strategy for this blackjack games called for you to stand those hands, also any soft 20 hand dealt out to you calls for you to stand that hand too. Insurance – Event though you will be offered the insurance side bet wager when playing this game online do not ever take it, for the 2 to 1 winning payout may seem attractive but the house edge attached to the side bet option alone is many times higher than the base game house edge and as such it is a very poor valued bet to take. There are plenty of casinos giving away to both new and existing players all manner of different bonuses, but be aware you are going to be very hard pressed to find any online casino site that will not attach an extra set of additional play through requirements to the bonus les when players choose to play blackjack with bonus credits. Always read through any bonus terms and conditions as some casinos online do not let player splay blackjack games with their bonuses! You will however always find plenty of blackjack comps can be earned when playing this Big Five Blackjack game online and it will pay for you to do some hunting around as most casinos offer a differently structured comp club and some of them are way more generous than others.